Where do we use electricity? Does luggage need electricity? What about a computer? 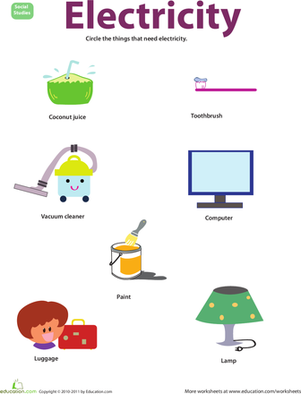 Use this worksheet to teach your child what everyday things use electricity to function. He'll practise his reasoning skills while he works, and he'll have a better understanding of electricity by the time he's done. Find more worksheets like this Here.